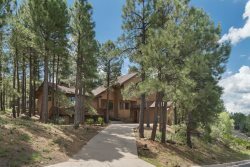 If you are looking for a beautiful, tranquil, luxury vacation destination, set amongst majestic Ponderosa Pine trees with just about every upgrade imaginable, you have found the perfect place! Beautifully Decorated Home with 4 Bedrooms and 2 Family rooms. The home was recently remodeled with beautiful wood floors throughout a lot of the home. It is beautifully adorned with stylish decor/furnishings with a hint of an exotic feeling as you would imagine at a retreat. There is a family room located on the upper and lower level. Gorgeous cabinetry, countertops, and stainless steel appliances are just the beginning. There is also a coffee bean grinder, coffee maker and french press provided. A blender, food processor, electric egg beater, and every other kitchen gadget you can imagine is also available. This home has two upper level and two lower level bathrooms. All have a shower or shower/tub combination. Whole-house activated charcoal water filter (even your showers will be filtered water). Drink water directly from the tap – it’s delicious! 64 Jet, 4 Horsepower hot tub that seats up to 6 people comfortably, underwater LEDs/lights with different lighting modes will guarantee an amazing time! The following Televisions are available for your enjoyment: Downstairs living room – 75” HD LCD SmartTV (Samsung) Downstairs Master Bedroom – 42” HD LCD (Sony) Upstairs Living Room – 42” HD LCD SmartTV (LG) Upstairs Master Bedroom – 42” HD LCD SmartTV (LG) All TV’s have TiVo and can record/view recorded shows. All TV’s have access to premium on-demand content from SuddenLink Cable On Demand (guests can stream shows on demand from SuddenLink, including all the premium channels like HBO, Shotime, Cinemax, Starz, etc). All TV's have all premium channels (movie channels, kids package, sports package). The upper level deck has attractive decor and comfortable furnishings. Save some time to enjoy and relax with all the beautiful trees that surround you. There are also decks on the lower level to be utilized and enjoyed. Please feel free to take out the hammock and take a peaceful nap. There is also an extended deck and privacy fence erected off of the hot tub area to further enhance your vacation experience. Sledding This home is on a slope and is great for sledding in the winter. This property is centrally located approximately 10-15 minutes from NAU, 10 minutes from Fort Tuthill, and about 15 minutes from Downtown Flagstaff. You can be in Sedona within an hour and the Grand Canyon is just an hour and a half away. Property Type House, 2300 sq. ft. In addition to the 4 bedrooms, there are 2 twin air beds available which are self inflatable. Books DVD Player: All TV’s have TiVo and can record/view recorded shows. Outside Deck / Patio: The home has upper and lower level decks. We loved that we got a quick response when asking about the firepit. Unfortunately we didn't have time to use it but we did like that someone got back to us quickly. We really enjoyed the owners story about how the property became to be a rental and their story. Nice touch made us appreciate all they had done. We thoroughly enjoyed our stay. The house was clean and comfortable, and had some terrific amenities (hot tub, entertainment room, furnished deck) that really upgraded the experience! The staff was very accommodating and awesome to work with. They were able to accommodate all of our requests. This house was perfect for our family of 10! (8 adults, 2 teenagers) Plenty of room, the kitchen was awesome for cooking, and the back porch was private and relaxing. Theres a nice strolling trail at the bottom of the hill great for a light walk and small children. Beautiful home, nice location! Comfortable beds! We enjoyed our stay at the "Tree House" so much! This house is equipped with everything and had plenty of room for our family of 10 (5 adults, 5 children)! After hiking all day, we came home to a crock pot meal, turned on the music, and relaxed in the spa. In the morning, we drank our coffee and hot chocolates out on the balcony and bird watched. It was so peaceful and quiet! Communication with Kathryn was great and instructions were clear. A drive to the South Rim was about 1 hour 15 minutes away, Sedona was about 30 minutes away, and the lower Antelope Canyon and Horseshoe Bend was about 2 hour 10 minutes away. Lots of hiking in the local area. The boys hiked the lava cave which was 30 minutes away. I highly recommend this place!! You will not be disappointed!! Kathy was absolutely amazing when it came to helping me make all the arrangements. I was trying to plan my sisters bachelorette party while living in England so it was difficult at times. Kathy made it a very smooth process. Thank you. The property was perfect for our event. It fit all the girls comfortably and was a great space for us to hangout, cook dinner and spend quality time together before the wedding the following weekend. It was also a short ride into town which is convenient as well. Would most definitely stay here again and would recommend for friends and family for future stays. Was the perfect property for our weekend getaway; had everything we needed. Outstanding. All communications were answered promptly. Instructions were clear. I wrote a review but briefly our stay was perfect. All 10 of us were impressed with the the TreeHouse. It had everything anyone could want in a home. We had a wonderful time. There was plenty of space for everyone to gather together or have quiet time. Thank you for helping us make family memories. My family from Naples, NY and San Francisco loved the property. It was very spacious and comfortable. It was nice to have so many bathrooms and a hot tub. The location is beautiful and so convenient. We went to Slide Rock in Sedona, Bearazona in Williams, and The Grand Canyon. All are easy day trips. There's also lots of great hiking close by, including Pumphouse Wash. Flagstaff is a great town - not touristy and has lots of good restaurants. There's so much to do near the property. Kathy was very quick to respond to emails. We had a great time at the Treehouse. The layout of the property and the amenities were very conducive to family gatherings and activities, but also provided enough personal space. The family room downstairs was great, room for all. We also appreciated the four bathrooms, and the location was convenient to all our daytrips and shopping. Great service and easy to work with. Thanks. Great house. We would stay there again. The property manager was very prompt in emailing me back both when reserving and when we needed some assistance with the property. The Treehouse home was very comfortable and spacious. Kathy was great to work with. She responded to all of are questions and needs very quickly. The property was great for our families vacation. It was central to all the areas that we wanted to visit. It was our first time in Arizona., we couldn't have asked for better accommodations. The neighborhood was great. There was a trail very close to the home that we enjoyed walking. All of the bedroom were very spacious. The home afforded us quality time together as a family and privacy when we wanted it. We hated to leave, but we'll be back!! Kathy was wonderful! A few days before our departure, I was unable to locate the email with instructions on check-in. So, emailed Kathy & she responded within minutes! In the guest notebook, there were several pages of instructions on how to use the iPads- which we were unable to locate. We didn't need them; but we were concerned that maybe they had been misplaced or stolen. Once again, Kathy responded in a timely manner! Loved it! My favorite part was the outside comfy chairs. Each morning, I would start my day out there- just taking in the beauty of the area! It was a lovely home- inside and out! Kathy was amazing. Very quick to respond to all our questions. We had an amazing time. It was the perfect place for families to stay! We can't wait to come back! Great team. Our stay was perfect. Great Service. Just excellent. Great property. Everything was working.